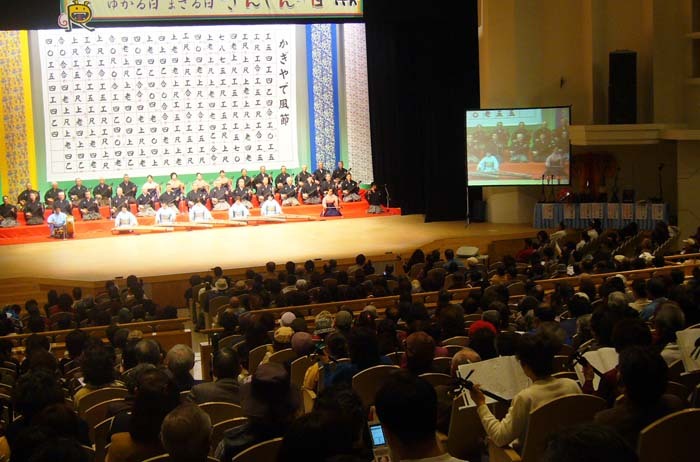 The main concert of the Sanshin Day is held at Yomitan Culture Center Ootori Hall. Sanshin has an unique place in Okinawan people’s heart, so it’s only natural that the instrument has its own day, Mar. 4th. Former RBC radio station chief Naohiko Uehara is credited for starting the day in 1993 when he invited everyone to play sanshin with him in a radio program on Mar. (san) 4th (shi). On Sanshin Day, a large number of sanshin players from very young to veterans play their instrument on stage at Yomitan Ootori Hall in a day-long concert that is aired on local radio. In addition to Okinawa, the program is aired in Japanese cities with large Okinawan communities, such as Fukuoka, Nagano, Tokyo, Osaka and Kobe. It has also been broadcast in Hawaii, Chicago, Los Angeles and Brazil in overseas. The concert at Yomitan Culture Center Ootori Hall starts at 11:45 and runs all day to 21:00. Admission to the concert if free, but require a numbered ticket. Tickets are currently available only at RBC Office at 3-2-1 Kumoji, Naha. The office is open on weekdays from 10:00 to 17:30. The Sanshin Day will feature a variety of activities and performances across the island, hosted by television networks, clubs and music groups. According to RBC officials, at least 100,000 people throughout the prefecture play sanshin on Sanshin Day. Although sanshin was originally reserved for the Ryukyuan nobility, the sanshin became the favorite of the commoners during the nineteenth century, and is currently experiencing a sort of renaissance. It is said that when a fire broke out in a house, the first thing Okinawans rescued was the sanshin whereas in mainland Japan it was the sword. Nevertheless, such is the popularity of the sanshin nowadays that its soulful sounds are incorporated in many contemporary popular tunes. In the years following WWII, many Okinawans even made sanshin using empty tin-cans as the voice box, known as “kankara sanshin”.